What Is DA Form 7574-2? 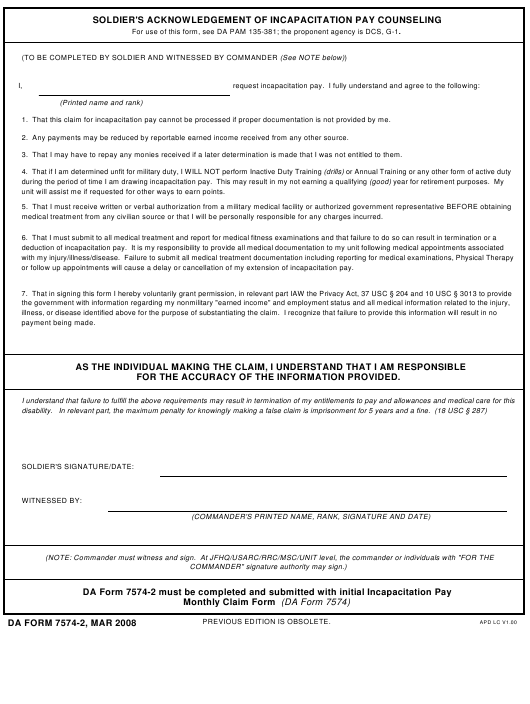 DA Form 7574-2, Soldier's Acknowledgement of Incapacitation Pay Counseling is a form that testifies to the fact proper incapacitation pay counseling had been received by a service member that sustained an injury, illness, or disease while performing their military duties. An up-to-date of the form - sometimes incorrectly referred to as the DD Form 7574-2 - was released by the Department of the Army (DA) in March 2008. A DA Form 7574-2 fillable version is available for e-filing and download below or can be found through the Army Publishing Directorate website. How To File Da Form 7574-2? 1. That this claim for incapacitation pay cannot be processed if proper documentation is not provided by me. 2. Any payments may be reduced by reportable earned income received from any other source. 3. That I may have to repay any monies received if a later determination is made that I was not entitled to them. unit will assist me if requested for other ways to earn points. medical treatment from any civilian source or that I will be personally responsible for any charges incurred. or follow up appointments will cause a delay or cancellation of my extension of incapacitation pay. FOR THE ACCURACY OF THE INFORMATION PROVIDED. If a soldier sustains any injuries, diseases or illnesses that result in an inability to perform military duties or lead to a reduction or loss in non-military income they may initiate an incapacitation pay claim. The soldier should promptly notify the first line leader and unit commander of the injury or illness. They, in turn, should immediately ensure that appropriate medical care is provided to the soldier and notify the next higher headquarters of the case. Next, the unit commander or the authorized representative counsel the soldier to read and sign the DA 7574-2. The form must be completed by the soldier and witnessed by their commander. The form lists seven conditions for receiving incapacitation pay. The soldier must read them and certify their agreement by providing their name, signature, and date of signing on the form. By signing, the soldier takes full responsibility to provide detailed and accurate information about their case. DA Form 7574, Incapacitation Pay Monthly Claim Form, is a document used for claiming incapacitation pay. The data provided within the DA 7574 is used to determine the soldier's eligibility for any payments. DA Form 7574-1, Military Physician's Statement of Soldier's Incapacitation/Fitness For Duty, contains information necessary to verify the soldier's eligibility for military duties after an injury or illness.